There is a certain magic that live performance has that other art forms will never be able to replicate. I was reminded of this when halfway through the First Act of the Birmingham Royal Ballet’s Beauty and the Beast, Belle’s father, Maurice, is affectionately (if slightly creepily) embraced by an armchair in the Beast’s enchanted castle. I am still dying to know how the set designer, Philip Prowse, pulled that off. David Bintley’s Beauty and the Beast is a gothic fairytale at its finest. I walked in expecting the sugar-spun pastels of a traditional ballet and was treated instead to the lovechild of Guillermo del Toro and Charles Perrault. Every element from the dancers, the costumes and the music is beautiful in its own right. Together they create a powerful piece of theatre. The ballet opens with the Prince and his friends being punished for hunting a vixen through a forest. A woodcutter enchants them to reflect the beasts they carry inside them. This results in our protagonist the Beast, but also means we are treated to a ball at the Beast’s castle later in the ballet with dancing mice, ravens and even a rabbit. The vixen is turned into a Wild Girl played by Yaoqian Shang, a dancer brimming with personality. The chemistry between the principal leads is electric. Brandon Lawrence as the Beast is one of the most impressive leads I’ve seen in a while. His Beast was strangely cat-like, driven to rage or mournful despair in unnerving turns yet still managing to seduce Belle and the audience. Yvette Knight as Belle, while not given as interesting a role to play, is as smooth as silk and gives her typically innocent character an air of sophistication that gives maturity to the romance unfolding on stage. Played out against the dark romantic score by Glenn Buhr, their pas de deux is tender yet almost frightening in its intensity. The contrast between the lush dark set of the Beast’s castle and the powdered and silk townhouse of Belle’s home is skillfully done, going from the decadent revelry of the enchanted ball, led by an audience favourite Tzu-Chao Chou as the Raven, to the pretentious wedding ceremony of the appropriately named Monsieur Cochon. I normally am not a fan of crowded sets as it cramps the dancers but this worked for me. The creative team are so in sync with each other that everything, from the comic timing of characters like Cochon and Grandmere to the cold moonlit garden where Belle in a white dress rejects the Beast’s proposal, is flawless. The lighting by Mark Jonathan is especially beautiful, turning the enchanted castle from a place heavy with shadows to an afternoon full of golden sunshine. 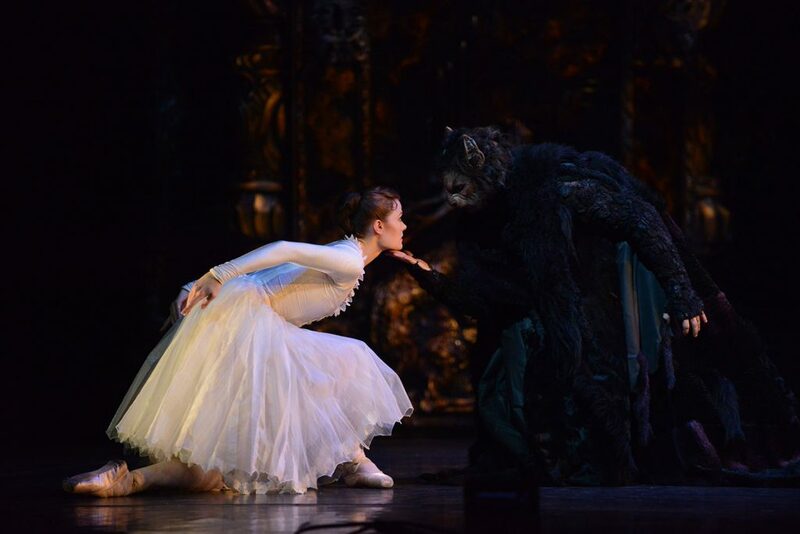 Famous fairytale ballets can often fall flat after being re-imagined over and over again, but this production of Beauty and the Beast has proven to be both timeless and exciting. It is one of the best ballets I have seen, and the wonderful set, costumes and cast live up to the gothic fairytale dream the creative team has concocted for us. Beauty and the Beast ran at The Lowry, Salford from 20-23 March. It tours to Sunderland and Bristol in March and May. More info here.